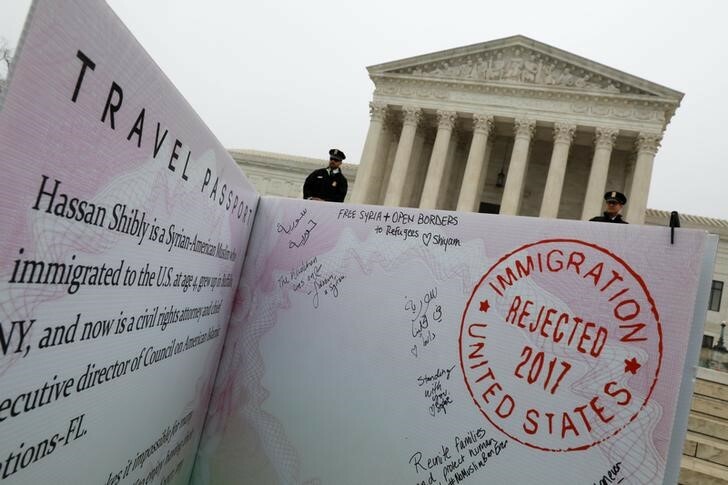 A narrowly divided Supreme Court said Tuesday that federal authorities have broad powers to detain indefinitely and without a bond hearing legal immigrants who have committed certain crimes that make them eligible for deportation. It does not matter whether authorities pick up such noncitizens years after they have been released from criminal custody, Justice Samuel Alito wrote for the majority in the 5-to-4 decision. Federal law mandates detention for certain immigrants while awaiting deportation proceedings. “As we have held time and again, an official’s crucial duties are better carried out late than never,” wrote Alito, joined in the outcome by his fellow conservatives. While the Obama administration held the same view of the law, it has become more important for the Trump administration, which has stepped up deportation enforcement and complained that policies of “sanctuary cities” hinder its ability to learn of the release of those whose crimes make them deportable. As is often the case, the justices were debating what lower courts have found to be ambiguous wording in a federal statute. It says the attorney general “shall take into custody any alien” who has committed certain offenses “when the alien is released” from state or local custody. The U.S. Court of Appeals for the 9th Circuit said that meant immediately upon release from custody. Other courts have said that is impractical and that “when” means when the government learns of the person’s release, even if it is years later. Alito said the plaintiffs’ assertions that “they are owed bond hearings in which they can earn their release by proving that they pose no flight risk and no danger to others” is not supported by the statute’s text or structure. “In fact, both cut the other way,” he wrote, joined in the outcome by Chief Justice John Roberts and Justices Clarence Thomas, Neil Gorsuch and Brett Kavanaugh. Justice Stephen Breyer wrote for the court’s dissenting liberals and underlined his disagreement by reading part of his opinion from the bench. “In deciphering the intent of the Congress that wrote this statute, we must decide – in the face of what is, at worst, linguistic ambiguity – whether Congress intended that persons who have long since paid their debt to society would be deprived of their liberty for months or years without the possibility of bail,” Breyer wrote. But Alito said it would be impossible to hold federal authorities to a standard that said someone must be picked up the day he is released from criminal custody. Breyer seemed to take exception to that. “These aliens may . . . be detained for months, sometimes years, without the possibility of release; they may have been convicted of only minor crimes – for example, minor drug offenses, or crimes of ‘moral turpitude’ such as illegally downloading music or possessing stolen bus transfers; and they sometimes may be innocent spouses or children of a suspect person,” Breyer wrote. American Civil Liberties Union Deputy Legal Director Cecillia Wang, who argued the case at the Supreme Court, said the case was reminiscent of one last term in which the court limited the ability of immigrants to object to their detention.